A special screening of the opening two episodes of Series 6 is to take place across Australia and New Zealand on Thursday 14th March, the BBC has announced. In a world-first multiple cinema screening for Doctor Who, The Impossible Astronaut and Day of the Moon will be shown at selected Event Cinemas, Greater Union and Birch, Carroll & Coyle Cinemas, and Village Cinemas across the two countries, starting at 7pm on the day. There will also be a "best-dressed" prize at each cinema for the Doctor Who fan with the most impressive costume, from Time Lords to monsters. We're building on the concept of "event television" by creating simultaneous Doctor Who experiences on big screens across Australia and New Zealand for the first time. It's an opportunity for fans to enjoy the programmes and participate in the whole experience in a way that they've not been able to before. We hope this will be the start of more BBC Worldwide cinema events with our partners Event Cinemas and Village Cinemas. The screening has been arranged as part of the celebrations for the show's 50th-anniversary year. Written by Steven Moffat and directed by Toby Haynes, the 90-minute two-parter stars Matt Smith as the Doctor, Karen Gillan as Amy Pond, Arthur Darvill as Rory Williams, Alex Kingston as River Song, and Mark Sheppard as Canton Everett Delaware III. In The Impossible Astronaut, the Doctor, Amy, and Rory receive a secret summons that leads them to the Oval Office in 1969. Enlisting the help of a former FBI agent and the irrepressible River Song, the Doctor promises to assist President Nixon in saving a terrified little girl from a mysterious Space Man. In Day of the Moon, the Doctor is locked in the perfect prison, while Amy, Rory, and River Song are being hunted down by the FBI. But with the help of the president and Neil Armstrong, the Doctor is able to mount a rebellion against an alien invasion dating back to the very beginnings of human civilisation. Tickets for the high-definition big-screen showings can be bought online at Event Cinemas or Village Cinemas (booking fees may apply) or at the box offices of the cinemas involved. The websites list the cinemas taking part in this special event. UKTV, which is wholly owned by BBC Worldwide Australasia, is the media partner for this screening, which has been devised by BBC Worldwide Australasia. Al Jazeera has bought Series 5 to 7 of Doctor Who, it was announced today. The episodes were snapped up at the BBC Worldwide Showcase 2013 event and will be shown on the satellite TV broadcaster's pan-Arabic children's channel JCC, which launched in 2005 and is based in Qatar. The showcase is a four-day international TV market being held at ACC Liverpool. It started yesterday and is welcoming some 700 TV buyers from around the globe. Drama is topping the bill at this year's showcase and it's clear that BBC Worldwide's programming, with its quality scripts and first-class production values, are extremely attractive to global buyers. Among the star names at yesterday's gala opening were Eve Myles and Mark Williams. The showcase will also be hosting special events to both celebrate the 50th anniversary of Doctor Who and to spotlight the natural-history documentary series Africa. In another record-breaking year, we welcome our largest number of buyers to Liverpool - up by 10 per cent on last year - and we have two brilliant programme-themed evenings planned. Africa is certain to capture the imagination of our delegates, as it has the British public over the past few weeks. What a perfect opportunity to also celebrate the world's longest-running sci-fi series with Doctor Who in its 50th year. The Doctor Who story The Doctor's Wife has won the Ray Bradbury Award for Outstanding Dramatic Presentation in this year's Nebula Awards, the annual event held by the Science Fiction and Fantasy Writers of America. Although Doctor Who was nominated for the same award last year, this is the first time the programme has been successful. In winning the award the team beat several Holloywood movies including Martin Scorsese's Hugo and Woody Allen's Midnight in Paris. The Doctor's Wife was the fourth episode of the 2011 series of Doctor Who. It was written by acclaimed author Neil Gaiman and directed by Richard Clark. Thanked everyone, including Verity Lambert and Sydney Newman. Also thanked Steven Moffat who made it what it was. Best showrunner ever. Richard Clark also took to twitter to express his delight at the award. Perfect start to Sunday - kids stayed in bed till 6.30, sun is shinning [sic] and The Doctor's Wife just won The Hugh [sic] Bradbury award. It's not everyday you can claim to have stolen a march on Scorsese AND Woody Allen. Hey, you two! FANTASTIC news. Doctor Who has never bagged one of those, tho' we've tried. Clearly we needed YOU. Three 2011 Doctor Who stories have been nominated for the 2012 Hugo Award for Best Dramatic Presentation, Short Form. The scripts for Neil Gaiman's The Doctor's Wife and Tom MacRae's The Girl Who Waited, will compete against showrunner Steven Moffat's A Good Man Goes to War to win the award which will be presented at Chicon 7 to be held in Chicago, Illinois, at the end of August. Doctor Who has won five previous Hugo Awards, with Steven Moffat winning for The Empty Child/The Doctor Dances, The Girl in the Fireplace, Blink and The Pandorica Opens / The Big Bang, while Russell T Davies and Phil Ford won for The Waters of Mars. The awards are given every year for the best science fiction or fantasy works and achievements of the previous year. The award is named after Hugo Gernsback, the founder of the pioneering science fiction magazine Amazing Stories. Also nominated this year is Doctor Who writer Paul Cornell who has received two nominations. His book The Copenhagen Interpretation is nominated as Best Novelette while SF Squeecast in which he takes part is nominated for Best Fancast. 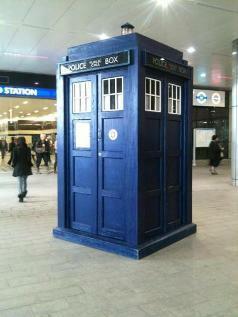 The TARDIS has landed at Westfield Stratford City bringing the Doctor and his companions to the shopping complex to launch the Series 6 Box Set released in the UK today. Matt Smith, Karen Gillian and Arthur Darvill will all be attending the event held at the brand new mega complex adjoining the 2012 Olympic site in east London. The three stars will be signing copies of the box-set at HMV before attending a question and answer session in the Gallery Area. Fans around the world can view the experience via the BBC Worldwide YouTube channel from 1600GMT (4PM UK, 11am ET) today. The three stars will be answering questions in a panel hosted by DJ Jo Whiley. They'll also be updates from the event on the BBC Facebook page and Doctor Who is also taking over the BBC Worldwide Twitter channel. Fans are encouraged to tweet with the hashtag #doctorwho all day.